Apple: "Look - look at how evil Amazon is!" It's not us! It's Amazon! They're the ones you want! 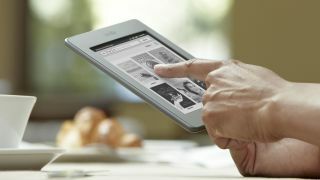 - comes the cry from the Apple camp in the wake of Judge Cote's decision that Cook and co are guilty of fixing ebook prices. A statement from Cupertino states Apple's intention to appeal the ruling, adding that Amazon is the real villain of the piece. Apple spokesman Tom Neumary said in a statement, "Apple did not conspire to fix ebook pricing and we will continue to fight these false accusations. "When we introduced iBookstore in 2010, we gave customers more choice, injecting much needed innovation and competition into the market, breaking Amazon's monopolistic grip on the publishing industry. "We've done nothing wrong and will appeal the judge's decision." Apple's impassioned statement, which we can't help but imagine being read out accompanied by an indignant stamp of the foot, comes shortly after it was revealed that Judge Cote ruled to the contrary. The Department of Justice's assistant attorney general Bill Baer described the ruling as "a victory for millions of consumers who choose to read books electronically". Judge Cote's ruling conceded that publishers were complicit in the price fixing skulduggery, but added that "compelling evidence" indicated that "without Apple's orchestration of this conspiracy, it would not have succeeded as it did".